April 27 (Proactive Investors) Eumeralla Resources (ASX: EUM) has been admitted to the official list of the ASX and is set to begin trading on Thursday 3 May. The company will hit the boards at 12pm (EST) with around 20 million shares on issue, following a successful IPO offering 17.5 million shares at A$0.20 per share to raise a minimum $3.5 million. Eumeralla is focused on the acquisition and exploration of mining projects in Mongolia. The company already holds one granted minerals exploration licence in northeast Mongolia which covers 12,657 hectares including the historical Chuluun Khoroot tungsten mine, active between 1945 and 1955. The licence is located about 20 kilometres north of the town of Dashbalbar and 85 kilometres northwest of the Solowevsk-Choibalsan railway. Previous exploration at the project has defined tungsten targets, but follow up exploration has been limited. Eumeralla plans to focus initially on tungsten exploration, planning a geological mapping and surface sampling program followed by geophysical surveys and aircore and reverse circulation drilling to test the anomalies. Other commodities could be targeted at the project in the future. 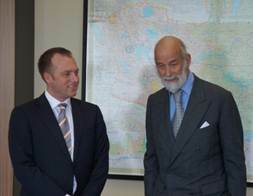 April 19 (CPSI) This Tuesday on April 16, His Royal Highness Prince Michael of Kent paid a visit to the offices of CPS International, the Garrison Capital companies, Hunnu Coal and TWB Drilling at their Central Tower 12th Floor offices during his visit to Mongolia at the invitation of the Prime Minister of Mongolia Batbold Sukhbaatar. 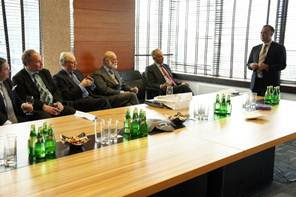 His Highness and company were received by Jason Peterson, Director of CPS Securities and representatives of the Central Tower Level 12 companies. Prince Michael is a grandson of King George V and Queen Mary, cousin to Queen Elizabeth II, and represents Her Majesty abroad on occasions. Jason Peterson gave a tour and introduction of CPS Securities’ activities in Mongolia, starting with its first venture into Mongolia Voyager Resources, Hunnu Coal, Haranga Resources, Wolf Petroleum, Gobi Lithium, and TWB Drilling. He is accompanied by Mr. John Grogan, Chairman of the Mongolian British Chamber of Commerce, and British business delegates. During his visit he will hold meetings with the Prime Minister and his cabinet members, the Mongolian Stock Exchange, and appear on the “De Facto” talk show, as well as host charitable events. SGQ closed -12.4%, 1878 currently trading -10%, IVN closed -5.65% in Toronto, -5.94% in NY. MRAM suspended all the licenses of its sole Mongolian subsidiary SouthGobi Sands, according to an interview with Head of MRAM. April 16 (Financial Post) In Mongolia, almost anything Chinese is viewed with suspicion — including deals with Canadian mining companies. A new political debacle in the land-locked Asian nation has thrown a wrench into plans to transfer control of Canadian miner SouthGobi Resources Ltd. to China. On Monday, the Mongolian government announced it will suspend SouthGobi’s mining and exploration licences on the rich Ovoot Tolgoi coal mine. The announcement came out of nowhere, and SouthGobi maintained that its licenses are in good standing. According to sources, the move appears to be largely political. Earlier this month, Ivanhoe Mines Ltd. agreed to sell its 57.6% stake in SouthGobi to state-owned Aluminum Corp. of China Ltd. (Chalco). The move allows Ivanhoe to focus its resources on the US$6-billion Oyu Tolgoi copper-gold project, also in Mongolia. The deal received some negative reaction in the local press. Mongolians feel overwhelmed by China, their powerful southern neighbour, and are wary of increasing Chinese investment in their country. There was particular concern about this deal because it was struck between Canadian and Chinese firms, and Mongolia got no say in it. Tensions in Mongolia are also heightened by the current political climate. Elections are coming up in June, and late last week, former president Enkhbayar Nambar was arrested and jailed on corruption charges following a dramatic police raid of a compound. He was planning to run for parliament in the election. It appears that this conflict might be resolved by simply giving the Mongolian government a chance to review the transaction. SouthGobi said it has already reached out to Ivanhoe and Chalco and asked them to discuss their deal with the government. But even if the deal closes as planned, the proposed suspension casts a black cloud over Mongolia, a fledgling democracy that is struggling to prove it is a good destination for foreign investment. The country appeared to reach a breakthrough in late 2009, when it struck a deal with Ivanhoe to develop Oyu Tolgoi after years of talks. But there have been occasional slip-ups since then. One of the biggest slip-ups came last fall, when the government attempted to re-open the Oyu Tolgoi negotiations and take a bigger piece for the state. It backed away from that request after getting denounced by the international community. April 17 (Reuters) - SouthGobi Resources Ltd said on Tuesday Deloitte & Touche LLP resigned as auditor of the company on its own initiative prior to the expiry of its term of office. SouthGobi, which sells metallurgical and thermal coal mainly to customers in China, said: "Deloitte has not expressed any reservations in its report for the two most recently completed fiscal years of the company or for any period subsequent to the last completed fiscal year." PricewaterhouseCoopers LLP has been appointed as the company's auditor with effect from April 2, the company said. SouthGobi said a day earlier that the Mongolian government suspended exploration and mining licenses for its Ovoot Tolgoi coal mine following Chinese aluminum giant Chalco's bid to acquire a controlling stake in it. TORONTO, ONTARIO--(Marketwire - April 16, 2012) - Khan Resources Inc. (TSX:KRI) ("Khan" or the "Company") is pleased to announce that it intends to raise up to CDN$2.312 million in a non-brokered private placement by issuing up to 13,600,000 common shares of the Company at a price of $0.17 per common share. A lead order for the offering has been placed by West Face Capital Inc. on behalf of one of the funds that it manages. In addition, a number of existing shareholders of the Company intend to participate in the placement. The private placement is subject to the final approval of the TSX and is expected to close on or about April 18, 2012. Any securities to be issued will be subject to a hold period of 4 months. Khan plans to use the proceeds of the offering to advance the Company's international arbitration case for $200 million against the Government of Mongolia and for general corporate purposes. West Face Capital Inc. is a Canada-based investment management firm with $2.6 billion of assets under management. Are There Copper-Gold Value Stocks In Mongolia's South Gobi Region? · Part 1: Ivanhoe Mines' (IVN) share price is down again, for the 3rd time since September 2011. · Part 2: A look at select details from the Oyu Tolgoi 513 page technical report that rating agencies and media have cited for Ivanhoe Mines share price decline and downgrades. · Part 3: Current events may create further price dislocation. · Part 4: Value opportunities created in junior copper-gold miners operating in the same region by Ivanhoe Mines' recent share price action. Review of the price action in four junior copper-gold miners in the region I discussed previously in November and December 2011. · Part 5: An in-depth look at two of those junior copper-gold miners in the region, one of which I interviewed in Mongolia in February 2012. · Part 6: Conclusion and notes. Ivanhoe Mines' share price is swooning again under the weight of a wave of news stories. The shares were down 30% from their March 13, 2012 close as of April 13, 2012. This is the third major offensive on Ivanhoe Mines' share price since September 2011. I discussed the prior two declines in Ivanhoe Mines share value in December. Since that time, Rio Tinto (RIO) has taken a 51% ownership stake in Ivanhoe Mines (in January 2012) and Ivanhoe Mines signed a memorandum of understanding in April 2012 to sell its 57.6% stake in SouthGobi Resources (SGQRF.PK) to Chalco (ACH). Mr. Wood has also previously been a director of Bellamel Mining (taken over by Norton Gold Fields), Black Range (BLKMF.PK), Elk Petroleum (EKPTF.PK), Iberian Resources, Kasbah Resources (KASBF.PK), Laguna Resources - since acquired by Kingsgate Consolidated (KSKGF.PK),Overland Resources and Signature Metals (taken over by Lion Gold). Hunnu Coal's sale to Banpu is the biggest success of Garrison Capital to date. In February, I met with Voyager Resources Managing Director Kell Nielsen and Joe Burke, Voyager Resources general manager of marketing, (who also helped lay the early groundwork for the sale of Hunnu to Banpu) in their offices in Mongolia. At the time there was a lot of optimism about their properties, particularly the KM property. Ulaanbaatar, Mongolia, April 16 /MONTSAME/ Five stock trades were held at Mongolia's Stock Exchange on April 9-13. In overall, 920.1 thousand shares were sold of 70 joint-stock companies totaling MNT 674.8 million. Index TOP-20 was 20379.38 points decreasing 68.28 units or 0.33% against the week earlier. The total market capitalization was set at MNT one trillion 966.2 billion decreasing MNT 2.4 billion or 0.12%. Shares of "Khodoo teever" /51.8%/, "Nekheesgui edlel" /33.7%/, and "Monkh undes" /32.1%/ increased, but shares of "Tomriin zavod" /15.0%/, "Ikh barilga" /15.0%/, and "Mongol shevro" /15.0%/ decreased. 39 stocks closed higher, 16 shares declined and 15 shares remained unchanged. Shares of "Khokh gan" /227.3 thousand units/, "Remikon" /223.5 thousand units/ and "Mongolia development resources" /210.0 thousand units/ were the most actively traded in terms of trading volume and in terms of trading value--"Mongolia development resources" (MNT 209.2 million), "Tavantolgoi" (MNT 90.9 million), and "APU" (53.9 million). 16 Apr 2012 (BDSec) – Mongolia stocks rose, with the local benchmark index headed for its biggest gain in 7 weeks. MSE Top 20 advanced 1.15 percent or 233 points to 20,612 points on Monday. Talkh Chikher (TCK), the leading manufacturer in the bakery industry of Mongolia, jumped 13.11 percent to the highest in more than six months. Beverage producer APU (APU), the second largest MSE-listed company in terms of market capitalization, gained 3.47 percent to close at MNT 4,449 today. The decliners were led by some other manufacturing stocks as Makh Impex (MMX) slipped 5.56 percent, Aduunchuluun (ADL) dropped 5.32 percent and Khukh Gan (HGN) fell 5.00 percent. Ministry of Mineral Resource and Energy and Mineral Resources Authority are collaborating to organize “Mining Mongolia 90” International Open Conference to commemorate the 90th year anniversary of Mongolian mining industry on May 9-10th 2012, in Ulaanbaatar, Mongolia. The conference will be open to public, and key speakers will include Mongolian mining industry’s top representatives from public and private sectors. April 16 (Bloomberg) Mongolia, whose economy grew the fastest last year, will sell new shares in Baganuur JSC (BAN) coal mining company to raise at least 60 billion tugrik ($46 million) to help fund infrastructure projects. The government wants to cut its holding to 51 percent from 75 percent by selling new shares, Gunsmaa Namgilsuren, a senior specialist at the privatization department of the State Property Committee, said today by phone from Ulan Bator. It’s now seeking banks to manage the sale, she said. Mongolia, which became China’s biggest supplier of coking coal in July, is seeking to offer minority stakes in its coal miners to foreign investors to fund roads and power plants that could boost production. Mining companies from Mongolia have raised more than $750 million in share sales abroad in the last two years. The share sales could more than quadruple once state-run coal miner Erdenes Tavan Tolgoi completes a planned $3 billion listing in Mongolia, London and Hong Kong later this year. The company is targeting output of 3 million metric tons this year, the same as Baganuur’s 2011 production volume. Mongolia’s state property committee, which is in charge of the tender, set an applications deadline of 6 p.m. local time on April 18, according to a statement on its website. An underwriter is expected to be selected by the end of May, Gunsmaa said. Baganuur, founded in 1978, has the sixth-largest weighting in the Mongolian Stock Exchange’s benchmark Top 20 Index with a 3.47 percent share. The company needs cash to expand production and upgrade equipment, Gunsmaa said. The company’s market value in February was 178 billion tugriks, based on a price per share of 9,775 tugriks, BDSec JSC (BDS), Mongolia’s biggest brokerage, said in a report the same month. Baganuur declined 2.7 percent to 7,100 tugriks today in Ulan Bator. Mongolia’s economy grew at 17.3 percent last year, the fastest rate, according to the World Bank . April 17 (BDSec) BDSec received an honor from the government and entered “Mongolian Top-100 Companies” list by the Mongolian National Chamber of Commerce and Industry. They have been organizing the event of selecting top national companies for the 11th year. The main purpose of the event is to encourage the companies which are making a significant contribution to the society, economy and business development of Mongolia and to improve their brand image. The selection of the companies based upon key evaluations, namely, social responsibility contributions, number of employees and number of jobs created for the respective year, sales revenue, total tax amount paid, corporate governance and financial transparency. In 2011, BDSec successfully executed the biggest domestic IPO for Sharyn Gol JSC. We also executed IPO for Silikat JSC and introduced the first corporate bond since 2008. We further strengthened our industry-leading position in 2011, with earning of a record MNT 1.4 billion, up 58.5 percent from MNT 819.5 million in 2010. We have opened few new branch offices to improve our customer services. In addition, BDSec was named “The Best Underwriter of the Year” by the Mongolian Securities Traders Association, “Entrepreneur of the Year“ by the Mongolian National Chamber of Commerce and Industry and “The Best Brokerage Firm in Mongolia” by the Mongolian Stock Exchange in 2011. HONG KONG, April 16 (IFR) - The enthusiasm that investors showed for two global bond deals from resource-rich Mongolia earlier this year failed to spill over to the banking sector last week, causing private lender XacBank to shelve its debut dollar deal. XacBank, Mongolia's fourth-largest, was eyeing a 10% coupon for a three-year deal, but investors balked at that level for a bank rated at B by Moody's and Fitch. "The pricing was wrong," said Harsh Agarwal, desk strategist with Credit Suisse. "I would any day own bonds from (Mongolian Mining Corp) trading at the same yield of 10% that was being offered by XacBank, a small privately owned micro-lender." Mongolian Mining Corp sold $600 million of five-year notes in late March, attracting a strong orderbook of $5.6 billion that allowed it price at 8.875%, one of the lowest-ever coupons for a single B rated Asian credit. The deal became a landmark transaction for Mongolia, as the country's largest ever deal, its first corporate deal and first ever 144a issue. In the last few years, Mongolia's rapid economic growth and rich mineral wealth has made it a key frontier market. MMC's transaction came after the Development Bank of Mongolia in early March sold $580 million of five-year notes, chalking up an impressive orderbook of $6.35 billion with over 300 accounts taking part. Prior to those two deals, the only Mongolian bank to issue debt in the international capital markets was Trade & Development Bank, the nation's oldest bank. XacBank's failure to get its deal off the ground is likely to send a clear message to Golomt Bank, the country's largest privately-owned bank, which last week announced its own plans to debut in the dollar market. XacBank was attempting such tight pricing based on the 5.75% pricing achieved by the Development Bank of Mongolia. However, that was because investors saw it as a sovereign proxy with plenty of scarcity value. "Mongolian banks which are privately owned will not enjoy the same support as the sovereign backed deals," said New York-based Shamaila Khan, portfolio manager with Alliance Bernstein. "Mongolian corporate borrowers need to prove themselves with respect to corporate governance and transparency. Technicals are also deteriorating as they are trying to pack in too many transactions in a short period of time without allowing time for investors to digest supply," he said. Hence, as it wraps roadshows, Golomt can expect a less enthusiastic response. One European account estimated the fair value for the Golomt bond would be in the neighborhood of 9.75%, while another fund manager said the deal size could be a maximum of $200 million. "Mongolia is definitely a growth story but if you ask me at the end of the day these deals are about the pricing," said a Hong Kong based fund manager. If XacBank's pulled deal has brought an end to the strong run Mongolian credits have enjoyed, investors agree that the country's growth story remains intact. Last year, Mongolia overtook Qatar to become the world's fastest-growing economy, according to Eurasia Capital, which is forecasting 20% GDP growth in 2012. The country's $8 billion economy had exports of $4.8 billion in 2011, up 64% from the year earlier. Minerals account for 88% of all exports, mainly coal, copper and iron ore. The country has overtaken Australia as China's biggest source of coking coal. The country is in a geographic sweet spot with Russia to the north and China to the south, said the Hong Kong fund manager. "In our meetings with the Ministry of Finance officials, they did seem to have structured growth plans, calling on investments from both the public and private sector." Still, for the banking sector, there are risks to consider, not least the rapid pace of loan growth. Like other resource economies, Mongolia is hostage to the volatile commodity sector. In a recent report, Fitch said loan growth has been rapid even by comparison with other emerging markets and cautioned that Mongolian banks need capital -- capital adequacy ratios are low in comparison to similar-rated entities elsewhere. April 16 (UB Post) This is an interview with A. Erdenepurev, the Head of the Fuel Strategy Department at the Ministry of Mineral Resources and Energy. Translated from the Undesnii Shuudan newspaper. -Isn’t it estimated that when a barrel of oil is worth more than USD 100, it is profitable to liquefy coal for gasoline? -Around seven or eight years ago, the estimation was USD 30, meaning that if the price of one barrel of oil went beyond USD 30, it was economically beneficial. But today, it is time to further advance and improve this formula. -It seems that liquefying coal in today’s economic situation is beneficial to both the producer and the consumer. What would you say about it? -Mongolia’s annual gasoline consumption has surpassed 1 million tons. It is estimated that this number will reach 1.5 million tons by 2015. We are supplying this daily-needed of raw material solely through imports. 98% of Mongolian gasoline is dependent on the Russian Rosneft. Of course, every Mongolian is interested in reducing this dependency and beginning to produce gasoline domestically. There are huge opportunities and possibilities for Mongolia in liquefying or gasifying coal. According to the estimation of Mongolian geologists, Mongolia has around 167 billion tons of coal. It is a very large amount and we must turn the raw mineral resources into usable fuel. -What is the usable reserve out of these 167 billion tons of coal reserve? -Currently, there are 20 billion tons of known coal reserves in Mongolia. Out of these 20 tons, 6.5 billion is at Tavan Tolgoi. Additionally, there are other coalmines such as in Choir, Nyalgyn, Tsaidam and Tugrug. The short-term goal of the Ministry of Mineral Resources of Energy is to establish a liquefaction plant for coal extracted from all these mines. -The raw materials are ready. Consumers just can’t wait for a fresh supply of liquefied coal. Private companies are requesting to build the plant. So what really is the problem? -We have a serious lack of technology. The whole world is talking about liquefying coal, and do you know how many of them have actually built them? In a testing, laboratory level, developed countries can extract liquid fuel from coal, and our professors and the National University of Mongolia are also doing the same. But there are so few of them on a large production scale. For example, a few years ago China built a coal liquefaction plant in Inner Mongolia and even today, they have not yet declared how much liquid fuel they are exporting. The Chinese have money, but the problem is technology. -During the President’s visit to Germany, the two sides have signed a memorandum about building a coal liquefaction plant in Mongolia. Tell us more about this. -The President has held a conference with German delegates on cooperating with each other’s mining, industry, and environmental protection sectors, and signed a cooperation memorandum with the German multinational conglomerate ThyssenKrupp. The memorandum was also signed with its subsidiary, ThyssenKrupp Uhde, on building a coal liquefaction plant in Mongolia. In addition to cooperation with Germany, we have also made a request to Korea, and Japan has already proposed to build a coal liquefaction plant based in Tavan Tolgoi. We are welcoming the proposal and looking into it. -What is the participation level of the Mongolian private sector on the establishment of the liquefaction plant? -There are four companies that have made significant efforts. They are Tsetsens Mining and Energy, Energy Resources, MAK, and Industrial Corporation Mongolia. These companies are interested in bringing in the coal liquefaction technology to Mongolia. -Why have we chosen German technology specifically? -It is universally accepted. It is environmentally friendly and they have successfully implemented their technology on a large-scale production, they are trusted. For example, the ThyssenKrupp Uhde has its own patents on coal liquefaction technology. Their technology is also financially beneficial. -Will the Government build the plant with the assistance of the private sector? -Yes, the private sector will play a significant role. Throughout the development, they have not just sat there doing nothing; they have made studies, researched the matter, and developed technical and economic assessments of the project. Now the Government will help them realize their objectives, for example, ease taxes when they import equipment and machinery for the plant and also guarantee buyers for their products. -When will the plant be in operation? -It is planned that in 3 – 4 years, first of the liquefied coal will be produced. The first year will be entirely dedicated to the technical and economic assessment. An assessment that is being developed under the partnership of MCS, Petrovis, Energy Resources and Industrial Corporation Mongolia is almost ready. Another assessment by MAK and Tsetsens Mining and Energy is in its final stages. -Of course, a plant like this, which requires high-end technology, will need a large amount of funding, how will this be solved? -A project to build a plant of this level will require at least USD 1 – 2 billion dollars. But depending on the overall capacity, they may differ. For example, one of the technical and economic assessments I mentioned above is planning to build a plant with a capacity of 400 – 500 thousand tons of fuel, and the other one will have a capacity 1 million tons of fuel. Mongolia’s GDP is USD 8 billion. The project’s cost will equal to one fourth of our GDP; we will pay careful, close attention to it. -What other companies are cooperating with Mongolia on this? -Mongolian MCS and Petrovis have signed partnership memorandum with Siemens, and Tsetsens Mining and Energy have signed agreements with the German Lurgi to purchase coal liquefaction technologies. -What will be the cost for the mineral territory usage license? -This is a business secret of the companies involved, so I am not able to disclose this information. The companies themselves, the National Security Council and the Government all have this information. -Do the above-mentioned companies have sufficient raw material supply, i.e. coal? Will the Government provide assistance to these companies on obtaining coal-mining sites? -Let’s start with Industrial Corporation Mongolia. This company owns the Tugrug Lake coalmine in Tuv Province. MAK says they will turn to their mine in Aduunchuluun for coal, which has a reserve of 285 million tons. Energy Resources sees that it has over 400 tons of coal available from its Ukhaakhudag, Choir and Nyalgyn mines. Tsetsens Mining and Energy owns Tsaidamnuur and Buurljuut steppe mines in Tuv Province. These mines have a confirmed reserve of 479 tons of coal, and an estimated reserve of 6.5 billion tons of coal. Estimates show that the coal reserve these companies have is sufficient for the coal liquefaction plant to run smoothly. -Tell us about the plant’s production capacity. What will be its annual rate of liquefied coal production? -I will tell you about it based on the technical and economic assessments. In a year, the plant will have the capacity to process 2 – 6 tons of coal, produce 400 – 800 thousand tons of gasoline and fuel, 50 – 100 thousand tons of LPG, 20 – 50 thousand tons of sulfur. Additionally, the plant will be capable of generating 200 – 300 megawatts of electricity. -What will be the price of the completed products? -After estimating all the costs, producing one ton of gasoline will cost at USD 600 – 670 dollars, and the cost of 1 ton liquid fuel will be at USD 700 dollars. -Does it mean that Mongolians will use gasoline that is twice as cheap as we use today? -We can’t say that exactly. Well, the gasoline we import have an average price of USD 1,100 dollars, so compared to that, it is cheap. -Since the Government is involved in the whole ordeal, why can’t they set a profit limit for the liquefied coal? There are no talks on setting such limits. The Government is providing a ton of support and assistance to the private sector on this. For example, the Government makes an agreement with the German side to reduce the license taxation on mineral territories, or reducing customs clearance taxes. There are more I could list. I don’t think the private companies, as they all support social responsibility, will try to sell their product at the same price as Rosneft products. Mongolian Mining Directory-2013 which provides information database for Mining companies, investors, suppliers, service companies, government and non government organizations will be published for the fourth year to commemorate the 90th anniversary of the Mongolian mining industry. The MMD is distributed free of charge to international and domestic mining companies, international conferences and exhibition, embassy offices in Mongolia and foreign countries to investors. BCM is a Supporting Organization of the MMD and welcomes Mongolian mining industry participants who are interested in advertising their products and services in Mongolian Mining Directory-2013. For more information please visit: www.mining.mn, www.mongolianminingdirectory.mn or call +976-7011 5590. ULAN BATOR, April 2012 (APB) – Bloomberg has launched Bloomberg TV Mongolia, in partnership with the Trade & Development Bank of Mongolia (TDB). Launched this month, the channel will offer a mix of locally produced, local language content — constituting four hours of daily output — as well as English-language news from Bloomberg TV. Baer will lead the creation of locally produced, local language content for the new channel. Bloomberg TV Mongolia, based in the Mongolian capital, will be distributed across the country via satellite and in Ulan Bator through cable TV and IPTV. “Bloomberg TV Mongolia will be available across Mongolia via D-Dish Ku-band satellite and in Ulan Bator by Univision IPTV, Sky C&C IPTV, Sansar Cable TV and Super Vision Cable TV,” Baer elaborated. VILNIUS, April 16 (The Baltic Times) - Representatives of nine Lithuanian business companies in consulting, banking, higher education, environmental protection and catering are taking part in a business forum in Ulan Bator, held by Mongolian Chamber of Commerce. The delegation, which will be visiting Mongolia on April 16-17, is headed by Lithuania's Deputy Foreign Minister Asta Skaisgiryte Liauskiene. The visit aims at strengthening Lithuanian-Mongolian economic cooperation. The main focus will be given to promoting export of Lithuanian goods and services to Mongolia. The delegation from Lithuania will meet with potential partners in Mongolia and visit some local companies. Lithuanians will discuss with Mongolia's officials opportunities of cooperating in bilateral trade, transport connections between the countries, they will also present Lithuanian higher education opportunities. LONDON, April 17, 2012 /PRNewswire/ -- On May 23 & 24, Coaltrans Conferences returns to Ulaanbaatar for the 2nd Coaltrans Mongolia conference, having welcomed over 300 leading coal industry specialists to the inaugural event in June 2011. "With Mongolia having overtaken Australia to become the largest exporter of metallurgical coal to China at the end of 2011 and companies from Australia, Canada, China, Japan, Thailand and Russia, to name but a few, developing coal mining projects in the country, Mongolia is arguably the most exciting country in the world from a growth and resources perspective. Mongolia is making every effort to add value to its natural resources to ensure that it can guarantee competitive prices for its coal in the international markets. What better time then, to convene its key players to make sure this is achievable?" said Henry Hely Hutchinson, Managing Director of Coaltrans Conferences. Graeme Hancock, COO, Erdenes Tavan Tolgoi JSC and Dr. G. Battsengel, CEO, Mongolian Mining Corporation, will deliver industry keynote presentations updating the delegation on Mongolia's most talked about coal projects. The forthcoming Government election is expected to confirm Mongolia's commitment to welcoming foreign investment. In the meantime, exploration and drilling programmes continue as well as companies' efforts to access financing from both the domestic banks and public markets to further develop existing projects. Combined with the need for financial support for the development of the national infrastructure projects, accessing capital will be one of the leading topics discussed by coal producers and investors attending the conference. With the exhibition close to sold out and extensive networking opportunities available at the conference, it will be a full packed two days with many Government officials, coal producers, service providers and investors debating and discussing the existing challenges while creating new business partnerships to the advantage of Mongolia's future. For more information please visit http://www.coaltrans.com/mongolia. Coaltrans Conferences organises large-scale international coal conferences, which attract delegates from all over the world. It also runs focused regional events, exhibitions, field trips and training courses. It has a reputation for employing the highest organisational standards. In 2012, Coaltrans is running events inAustralia, Brazil, China, Colombia, India, Indonesia, Mongolia,Mozambique, Russia, Singapore, South Africa, Turkey, UK and USA. For more information please visit http://www.coaltrans.com. April 16 (news.mn) Political life is intensifying in Mongolia after corruption related arrest of ex-president N.Enkhbayar. Last Friday, the MPP organized demonstration at Sukhbaatar square to release N.Enkhbayar and some members of the party has demanded the Government to release him soon. MPs O.Chuluunbat, Ch.Ulaan, D.Terbishdagva and Ts.Shinebayar were together with N.Enkhbayar at ex-president father’s home when police arrested him at dawn of Friday. The MPs have informed journalists at the Government House on Sunday and they noted that force organizations have rudely worked to arrest ex-president and Chief of the MPP. The MPs informed that they want to organize a working group to conclude arrest operation because of force organizations’ awkward arrest work and attack to MPs. Sunday was weekend and the MPs delivered their proposal to home of Speaker. Journalists asked about the MPP group that to run active work about the situation. Ch.Ulaan confirmed statement and the group is intending to renew the party activity. On Monday, nine MPs of the MPP including Ch.Ulaan, O.Chuluunbat, D.Terbishdagva, Ts.Shinebayar and D.Zagdjav have delivered a demand to Speaker D.Demberel about resignation of Justice and Internal Affairs Minister Ts.Nyamdorj. The demand has been written that “Police has ignored its duty to provide citizens’ tranquility and public order when it has arrested ex-president N.Enkhbayar at night of April 12 to 13. Police employees have significantly violated the Constitution and immunities of MPs. Justice and Internal Affairs Minister Ts.Nyamdorj must take accountability of wrong action of politics and ethics”. The MPs have requested to discuss resignation of Justice and Internal Affairs Minister Ts.Nyamdorj in conclusion of Managing Council of the MPP and the MPP caucus at Parliament that legislation organizations should not invade to others property when they run operation. If the organizations would violate laws, any official should take accountability. Besides, there is rumor that some members of the MPP have mentioned to bolt from the party and to enroll the MPRP, the party of N.Enkhbayar. April 16 (Terrtogii Blog) Officials took Mongolia’s third president into custody last Friday, stirring up protest among his supporters and in Parliament. The former president’s arrest has drummed up anger among the populace just months away from this year’s June elections. Videos of the arrest show former president Nambar Enkhbayar being escorted away without wearing shoes by out-of-uniform officials yesterday morning in Mongolia’s capital, Ulaanbaatar. A district court prompted the nation’s Anti Corruption Authority to go forward with the arrest for his repeated refusal to cooperate with a police investigation into himself for corruption. At around 9 p.m. last Thursday night protesters took to Sukhbaatar Square, the capital’s most common gathering place for protests, and the same place where unrest broke out on July 1, 2008 after anger over supposed election fraud. Angry citizens took to the streets after current President Ts. Elbegdorj told local press that the he felt the election had been fixed to allow the country’s Mongolian People’s Revolutionary Party (currently under the name the Mongolian People’s Party) to remain in power. That protest turned violent and demonstrators began marching the streets. Three high-ranking police officers are now facing charges for the murder of four individuals for their alleged distribution of live ammunition, according to a report by the Chinese news agency Xinhua. Officials announced the reasons for Enkhbayar’s arrest to the press following the public outcry. The lead investigator to the case for the Anti Corruption Authority, E. Amarbat, said the former president has been investigated since February 2010 for his private use of public funds. “We attempted to hand [Enkhbayar] a summons for his questioning 10 times, and each time he refused”, said Amarbat. The official added that his agency tried to reach him at his home and office to no avail. Enkhbayar has publicly vowed to refuse all questionings by investigators on the matter. The three main charges are the illegal privatization of local newspaper Ulaanbaatar Times, the illegal privatization of the Urgoo Hotel in his sister Enkhtuya’s name, and the use of donated equipment from Japan to open his own television studio and the station TV-9. Amarbat said that equipment for Japan was to be given to the government to produce religious-based programming. TV-9 is the same station whose journalists were facing pressures from police officials to reveal their sources to a story on the Ulaanbaatar Times. Privatization of the local newspaper began when Enkhbayar was president, but the government turned against after he lost the 2009 election to current Present Tsankhi Elbegdorj. The international press organization Reporters Without Border reported that the newspaper’s former editor in Chief, Dulguur Chuluunbaatar, was arrested in March last year and was held for two months. Officials said Enkhbayar will remain in prison for 12 days while interrogators question him on the charges. Once again there was protest at Sukhbaatar square by former President Enkhbayar’s supporters on the day of his arrest. At the rally demonstrators gathered waving the flags of Enkhbayar’s political party, chanting, “Free him”! Many offices located near Sukhbaatar, including Central Tower and the the Blue Sky Building, asked their workers to leave early on Friday. One person in attendance, Ulzii Bud, was one of the original supporters of Mongolia’s 1991 protests, where citizens demanded a democratic government. This year Mongolians will vote in parliamentary elections. Many voters have been swept up by populist sentiments, opposing foreign ownership of Mongolia’s land for mining. “I’ll vote for whoever works to represent our rights and is honest—someone like Enkhbayar”, said Bud. Nationalist undertones were also present, as much of Mongolia’s population fears foreign influences, especially from China. A recent proposal by Chinese aluminium producer Chalco to purchase up to a 60 percent interest in SouthGobi Resources, a coal miner with a project in Mongolia’s southern Gobi region, has many citizens upset. “I’m here protesting for the independence of my country”, said Shinee Enkhtaiwan , a herder from Mongolia’s rural regions. “People are using my country and we’re running out of land because of the Chinese who come and take it away”. “We’re running out of places to herd our animals to the miners”. Political instability has many foreign investors wary about directing their money into Mongolian enterprises. Mongolian policy makers have been known to speak out and act against the interest of foreign companies to stir up populist support. April 16 (Simon Fraser University) The Government of Mongolia has awarded SFU health sciences professor Craig Janes with a medal recognizing his work to help develop the country’s health sector. The award is the highest honour given to non-citizens. A medical anthropologist, Janes has spent the past 20 years researching a variety of issues in Mongolia related to public health. Recent research projects include an evaluation of health reform, social causes of maternal mortality, the effects of climate change on health in rural areas, and the health consequences of mining development. After years of developing close working and research partnerships with various Mongolian ministries and universities, Janes is gratified to see that his research is beginning to be reflected in government policies related to public health. For example, some of his recommendations in a 2001-2 evaluation of health reform undertaken with the Health Sciences University of Mongolia have been included in a reform package to be introduced in parliament. And research into the public-health impacts of mining development, funded through several grants from the Canadian Institutes of Health Research, is finding its way to government decision-leaders. They are discussing the issues with Janes and developing new policies and procedures to manage this rapidly developing sector of the Mongolian economy. Janes is currently in Santa Fe, New Mexico where he is the Henry Luce Fellow at the School for Advanced Research . During his nine-month post, which ends in May, he has been working on a book that summarizes his research into Mongolia’s political economy, post-socialist development, health and globalization.